Hot Off the Presses: New Books and Magazines! A few gorgeous new books and magazines have arrived here at Stash over the last couple of weeks! All the Stash Enhancers are incredibly excited about them, and our Chief Stash Enhancer even makes an appearance inside the pages of one! Botanical Knits is the eagerly anticipated, self-published book by Alana Dakos. The book features foliage-inspired patterns including 4 beautiful sweaters and 8 accessories. Botanical Knits has gorgeous photography, beautiful patterns, and some fun little details that really make the book special. The table of contents not only lists the pattern names with page numbers, but also has photographs of all the patterns with the page number next to them. A small detail that makes it incredibly easy to find the pattern you are looking for at a quick glance. Each pattern contains several photos of the project, a schematic, and detailed knitting instructions. There are also beautiful illustrations (by Neesha Hudson) of leaves and foliage throughout the book. It’s hard to flip through Botanical Knits and not be inspired to grab some needles and yarn and cast-on for one (or all) of the beautiful patterns immediately! It’s no secret that we’re big fans of Pom Pom Quarterly here at Stash. And yes, that is Sonia, our Chief Stash Enhancer, gracing the pages of Pom Pom’s First Anniversary issue! The Summer 2013 issue includes 7 gorgeous patterns, a s’mores brownie recipe (yum!) and a few fun articles. I’m particularly smitten with the Riverine Pullover and Mountain Moss Shawl. The newest issue of Knitscene is packed with 33 gorgeous accessory patterns ranging from simple hats to complicated colorwork mitts and cowls. These would be perfect projects to work on as the weather gets warm or while traveling, since they’re small and portable. Also included are a few great articles on embellishments and fun edging ideas. Which patterns are catching your eye? This beautiful lace border seems like it will never end. Back and forth it goes, growing longer and longer by the day. Eventually it will become the frame for an even more stunning shawl. Eventually. There seems to be a tipping point in every project where you feel like you’re making zero progress daily, and then all of a sudden you’ve knit way more than you realized. The challenge is keeping that in mind as you slog along. To enjoy the process, the feel of the yarn as it slides through your fingers, the joy of making something from nothing. Do you have projects that seem to drag on for ever and ever? Let us know how you cope in the comments below. Remember to make today amazing! We’ve all either heard or said something like this, haven’t we? Stitching in the summer is one of those subjects that seems to be a dividing moment between knitters and crocheters. Some of us are happy to pick up and put down our yarn throughout the year, happily working on a project when the mood strikes. Some of us need knitting like we need food, and are literally incapable of letting more than a few days pass without yarn in our hands. Regardless of your approach, we’re here to tell you that it’s okay. It’s okay not to play with yarn in the summer. It’s okay to knit a heavy wool sweater in anticipation of cooler weather. It’s okay to play with wool, silk, bamboo, cotton, and linen any time and anywhere (well, maybe not on an exam table or while riding a horse, but that’s up to you). If you’re looking for some new temptations for summer stitching, something that won’t be too hot or heavy, we’ve got options. Crisp linen, cool cotton, textured hemp, and luxurious silk yarns are on the shelves, shimmering with promise. The promise of what they could become in your pretty little hands. As the weather warms up in Oregon, we Stash Enhancers are dreaming of cotton blend tees, silk shawls, cashmere socks, and (gasp! )getting a head start on holiday knitting. There’s even been talk of planning new sweaters for fall! What does summer mean for your project basket? Does it lie dormant, waiting for cooler weather? Or are your hooks & needles just as busy as ever? Let us know in the comments, we’d love to hear from you! We have a fun new yarn at the shop! Introducing Kenzie by HiKoo, a versatile yet luxurious blend of New Zealand merino, nylon, angora, alpaca, and silk noils. The yarn is part workhorse wool, part luxurious icing on the cake. It knits up easily into a versatile fabric, which will be easy to wear in hats, scarves, and sweaters alike. We are smitten with the playful flecks of silk that pop out of the semisolid colors. Fun and classic at the same time. 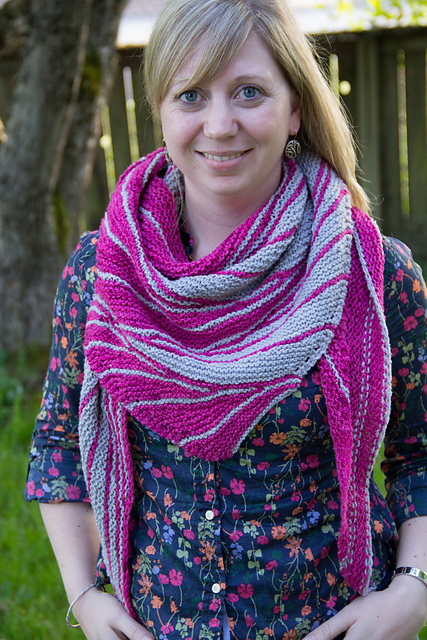 A lovely trio of Free patterns accompanies this new yarn. Sonia couldn’t resist the allure of combining two fun colors into a Tayberry Hat by Cirilia Rose. Which pattern will you knit first? Our newest shop sample is a perfect pairing of yarn and pattern: Knitted Wit’s Welterweight Rambouillet & Lee Meredith’s Robin. 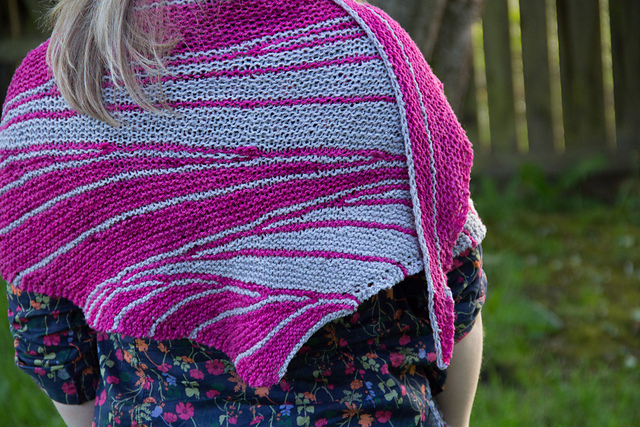 It’s no surprise that we’re huge fans of Lee’s innovative patterns and Lorajean’s unique and beautiful yarns, and the marriage of these two makes for one amazing shawl! One of my favorite things about Robin (besides the incredibly fun and addicting short rows! 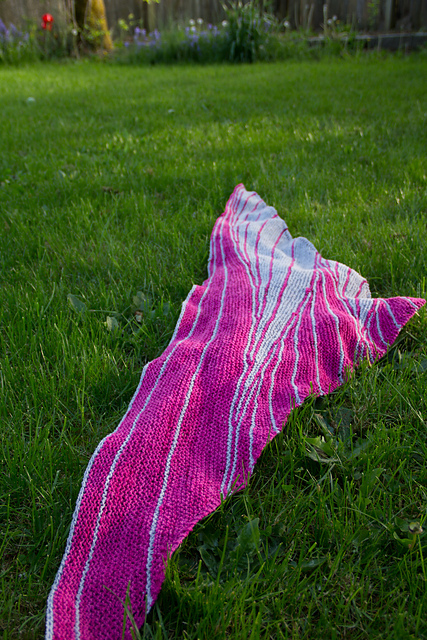 ), is that it’s designed so you can finish the shawl at virtually any point to maximize your available yardage. I was able to make the most of my 350 yard skeins and knit until I was almost out of the Raspberry Milkshake color. There is also a 3-color option available and Robin can be knit with any gauge yarn. The Knitted Wit Welterweight Rambouillet is sport-weight yarn that comes in skeins with 350 yards and dyed in Lorajean’s vibrant colors, which are perfect for spring. So what exactly is Rambouillet, anyways? Rambouillet is a breed of sheep whose wool has a wonderfully springy crimp that creates a soft, squishy fabric perfect for wrapping around your neck. It’s excellent for garments and accessories worn next to the skin and the Knitted Wit Rambouillet has a great texture that is just perfect for squishy garter stitch knits. Stop by the shop to squish the new sample and play with the gorgeous colors to come up with your own unique color combo!